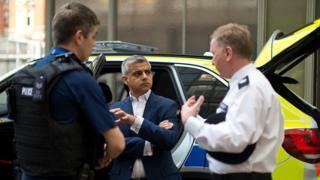 London's mayor has proposed raising council tax by the maximum amount in his power to help fund policing. Sadiq Khan said an average increase of 46p a week across homes in the capital would give the Metropolitan Police an extra £84.8m. He said additional money for firefighters would mean the overall increase per household per week would be 50p on average. Critics say Mr Khan is "not being entirely straight" about his budget. The mayor confirmed he would be proposing the increase after warning it may be necessary in an interview with BBC Radio London on Wednesday. Mr Khan's proposal would see his share of council tax increase overall by 9% or £26.28 a year in cash terms for an average Band D council tax payer. Of this, £24 will go straight to the Met and the rest will go to London Fire Brigade. This is the maximum amount mayors are allowed to increase council tax by without having a referendum on the decision. Mr Khan also announced that £6.8m of his total budget, raised by council tax and business rates, would be put towards his new Violence Reduction Unit after "concerns" were raised over how it would be funded. Mr Khan's proposed council tax hike is due to be confirmed at a London Assembly meeting on 25 February. Conservative assembly member Gareth Bacon, who chairs the budget and performance committee, said the "unwelcome" decision to raise council tax "should not be taken lightly". "Yet again, the mayor is not being entirely straight with Londoners," he said. "He has increased discretionary spending at City Hall in a range of areas. That money could have been spent on police officer numbers. "The mayor must look deep and hard at the way he is running this city. Robbing Peter to pay Paul is a sticking plaster policy and more long-term ways to get police the funding they need should be considered to ensure they are able to keep Londoners safe." Since 2010, central government funding to police forces across England and Wales has been cut by almost a third, in real terms.